1. 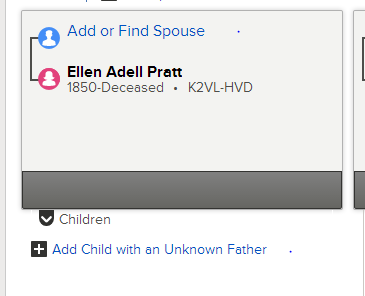 Let's suppose you found a descendant of an ancestor who is missing a spouse and there are no children listed (and this person was born more than 110 years ago). Where do we begin to look for records of the spouse and children? 4. Click "Search Records" to open the results in a different tab of the browser. 5. Look over the results. Perhaps some are obviously a match. This is found in the left column. Then search again (bottom of left column). In my opinion, it is wise to do this: add at least the first name of the parents. 8. 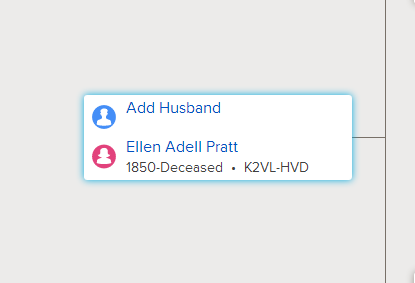 Hopefully you will find a marriage record for the spouse, or perhaps a census record will list the parents and new spouse in the same household. 9. If you still don't find a marriage record, it is worth a try to search at search.ancestry.com because they have a different set of records. It also finds misspelled records. 11. At least you can add or correct information based on the source documents you find, and you can add a note about why you came to your conclusions. Providing a list of source documents is a great service to the next person who researches this family. 12. 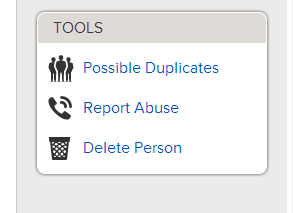 Click "Possible Duplicates" in the right column to see if there are duplicate records. You may want to do this at the very beginning, before validating all the information, in case there are obvious duplicates. 13. You can reserve temple names by clicking the "Ordinances" tab at the top of the person detail screen. The list of reserved names can be seen by clicking the "temple" link in the top menu. 14. To add photos or memoirs, click on the "Memories" tab next to the "Ordinances" tab.